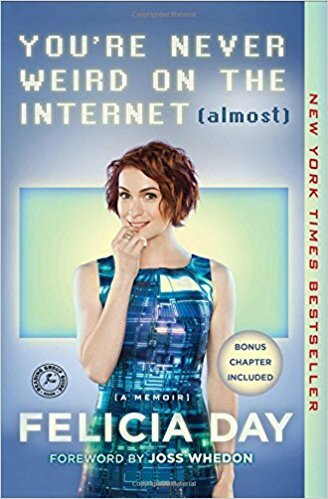 Continuing with the gaming theme that played a major role in Player by Proxy, Ready Player One, and The Chalk Artist, now we need to talk about Felicia Day’s amusing and engaging memoir, You’re Never Weird on the Internet (Almost). As you know — well, OK, maybe you don’t know — Felicia Day was an actor on Joss Whedon’s Buffy and on Joss Whedon’s Dr. Horrible’s Sing-Along Blog. Unsurprisingly, Whedon also wrote the foreword to this memoir, as you can see by examining the cover photo closely. Day is also well-known (in certain circles, but not mine) as the creator and producer of The Guild (which I have never seen). I listened to the audiobook version, which felt as if I were having a personal conversation with Felicia Day, perhaps because she took the unusual step of narrating her own story. (That step is unusual because most authors aren’t actors, but it worked in this case. Having an author who’s an actor certainly helps if the author is also going to be reading aloud.) In part this memoir is about her acting career, in part it’s about the rest of her life, but mostly it’s about her experiences as a female gamer. The story is inspiring, despite (because of?) Day’s evident level of anxiety and lack of self-confidence, which come across all too convincingly in her account. GamerGate certainly didn’t help, as you might expect, and I would have welcomed a longer analysis of it. Read (or listen to) the book!